Arlo Q vs Canary: What's the Difference between These Motion-Activated Cameras? Arlo Q vs Canary: What’s the Difference between These Motion-Activated Cameras? If you’re an ASecureLife regular, you’ve probably seen us mention the Arlo Q, our number-three best HD security camera, and Canary, our number-three best home security kit, before. Both Arlo Q and Canary are, at their most basic level, motion-activated, app-monitored cameras with nearly identical pricing. The Canary has some additional features, such as environmental monitoring, and is more of a security kit that is ideal for a dorm or small apartment. 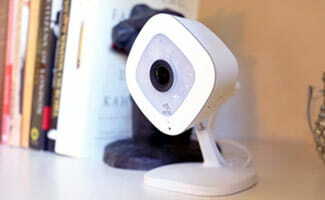 The Arlo Q performs a bit better and is an all-around more flexible device that can easily connect to a larger home security system. Read on to learn more about the features they share, what makes them different, and which one might be right for you. 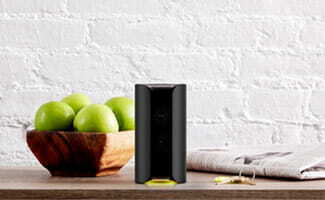 The Canary is a security kit, whereas the Arlo Q is simply a Wi-Fi connected, app-monitored camera. The Canary has environmental monitoring and a remotely controllable siren. The Arlo Q can zoom almost three times closer than the Canary. The devices and subscriptions are similarly priced, but Arlo Q subscriptions allow you to connect more devices. The Arlo Q has optional continuous recording. The Arlo Q has more flexible installation options. Both products perform as advertised, and reviewers don’t seem to have any major issues with either company’s customer service. The difference in customer experience is influenced by the difference in size, structure, and history of each company. NETGEAR, the manufacturer of the Arlo Q, is a much larger and better-established company, so it’s presumably better equipped (personnel-wise and financially) to deal with any customer service issues. Canary, on the other hand, is a fairly new company, and the handful of Canary home security devices are its only products. Because it was originally a crowdfunded project, Canary has been fairly transparent about its changes and developments as its device family grows and gets real-life consumer use. Canary has changed its subscription rates a few times in its four-year history, which has frustrated several customers. Many complain of feeling like this is a bait-and-switch tactic since they’ve already spent the money on the equipment. Unlike Canary’s, Arlo’s subscription rates have stayed fairly consistent. Even if you do decide to forego the subscription for the free plan, Arlo’s free plan allows you to connect more devices and view your Cloud recordings for longer than Canary’s free option does. If for some reason the devices don’t work out for you, both the Arlo Q and the Canary have fairly standard one-year limited hardware warranties. How do their features compare? There’s some give and take in terms of each device’s features. The Canary boasts a wider array of capabilities, but when it comes to shared features, the Arlo Q’s are generally more robust. For example, the Canary has environmental sensors and the Arlo Q doesn’t, but the Arlo Q has 8x digital zoom and two-way audio compared to the Canary’s 3x zoom and one-way audio. The Canary’s ability to track your home’s temperature, humidity, and air quality can help protect your home and health against environmental threats. You can keep an eye on temperature trends in your home, which may indicate that someone left a window open or that you need to insulate certain areas. The humidity monitor can help detect hidden water leaks or other moisture problems. The air quality monitor can help you identify unhealthy trends in your home, which can lead to allergies and respiratory problems, so you can take steps to purify the air. The cost of the individual devices is almost identical, with Arlo Q (view on Amazon) at $199.99 and Canary (view on Amazon) at $199.00. Both companies offer discounts when you purchase more than one device at a time, so keep that in mind if you plan on adding more units in the future. Canary and Arlo subscription plans are priced identically at all three levels. Canary’s plans are priced according to number of devices supported, whereas Arlo’s are priced according to both number of devices and Cloud storage. Neither monitoring subscription requires a contract, but both offer savings when you pay for a full year of monitoring up front. *With Canary’s free plan, the 24 hours of Cloud storage is distributed across the number of devices you have. So if you have one device, that device will get the full 24 hours. For two devices, each device would get 12 hours of storage, then three devices would get eight hours each, and so on. If you want more than four Canary cameras, you’ll need a subscription, and you’ll pay another $4.99 per month per additional device. Neither Canary nor Arlo Q requires extensive installation or hardware. Your main consideration will be making sure your device is connected to AC power at all times, since unfortunately neither has battery backup. Canary is designed to sit on top of a flat surface and cannot be mounted on the wall. (If wall mounting is important to you, check out the company’s latest development, Canary Flex.) The company recommends either placing the device in a central, high-traffic area of your home or having one device per main entrance. Arlo Q’s base can either sit on a flat surface or be mounted to a ceiling or wall using the included wall plate. It also comes with a magnetic plate so you can attach the camera to any flat iron or steel surface for extra-easy installation. Overall, the Arlo Q has more flexible installation options, meaning you can move the device around and adjust it to the changing needs of your home, but both devices are pretty simple to install. Both Arlo Q and Canary are monitored through smartphone apps, and both are available for Android and iPhone (including Apple Watch). You can also access the footage from each camera on your laptop or desktop computer using the Arlo and Canary web portals on your browser. Check out the mobile monitoring capabilities of each app below. View a timeline of motion detection, settings changes, etc. Which camera is the winner? It depends on what you’re looking for. If environmental monitoring is a must for you, then Canary is the clear choice between the two. But as far as motion-activated video goes, Arlo Q is a better choice because you get more out of its subscription plans. A home security kit like Canary is best for a dorm, small apartment, or small one-story house. It allows you to keep watch on your front door and monitor some of the environmental factors that may threaten the safety of your home, without the high-cost investment of a home security system. Just don’t expect the same kind of comprehensive coverage as a full, professionally monitored home security system, especially if you’re looking to monitor a larger space. Do you have a Canary or an Arlo Q? What do you like about your device? How can it be improved?